Shawn Randall was charged with first-degree murder. 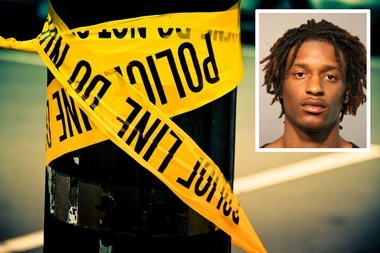 COOK COUNTY CRIMINAL COURTHOUSE — A West Ridge man was gunned down in front of his three young children Friday when a rival gang member — believed by locals to be rapper Lil Shawn — opened fire in the middle of the afternoon, prosecutors said Tuesday. The victim, 22-year-old Vallan Francis, and his fiancee had been outside playing with their kids — ages 7, 4 and 3 — when they noticed 19-year-old Shawn "Lil Shawn" Randall ride his bicycle down the street about 1:30 p.m., Assistant State's Attorney Jennifer Cooper said during a bond hearing Tuesday. Francis, a gang member, recognized Randall as a shooter in a rival gang, prosecutors said, adding that witnesses referred to Randall as "Lil Shawn." Shawn Randall, charged with first-degree murder, also goes by the name of Lil Shawn. 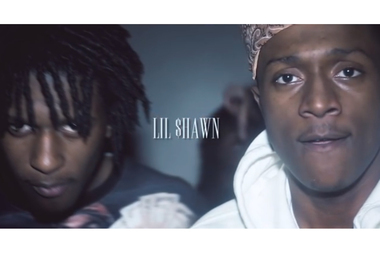 Randall (l.) appeared in a music video with controversial rapper Young Pappy (r.) who was killed in 2015. Francis and his fiancee thought Randall was dangerous and decided to bring their kids inside, Cooper added. As the couple gathered their kids' toys outside their home in the 2000 block of West Arthur Avenue, Randall walked back toward the house with a black hoodie pulled tightly around his face, according to Cooper. Witnesses recognized Randall, prosecutors said, because the top of his face was visible and some of his brown-tipped dreads popped out of the hood. As Francis reached for his daughter's bicycle, Randall opened fire, striking Francis four times, Cooper said. All three children and the fiancee were still outside when the shooting occurred. According to neighborhood sources, Randall or "Lil Shawn" is a rapper and associate of Young Pappy, the notorious North Side rapper who posted YouTube videos taunting rival gang members to take their best shot. They did, but twice killed someone else. Young Pappy himself was gunned down in May. Since then, the rapper's name has continued to appear in court cases. Last month, a 17-year-old was charged with murder after he fatally shot someone who posted a negative comment about Young Pappy on Facebook. READ MORE ABOUT YOUNG PAPPY'S MURDER HERE. On Friday afternoon, Francis was taken to St. Francis Hospital, where he was later pronounced dead. Police recovered a silver bicycle from the north alley of the building, Cooper said. And surveillance footage shows someone wearing a black hoodie running west through an alley after the shooting. Randall is currently on probation for a 2014 drug-possession conviction, according to authorities. Since being sentenced to two years probation on Oct. 20, 2014, Randall has violated his probation seven times. He currently has two pending probation violation charges. Randall, of the 6300 block of North Lakewood Avenue, was on electronic monitoring due to his probation violations at the time of the shooting. Court records show he left his home at 12:52 p.m. on the day of the shooting and didn't return until 10 p.m.
Randall was arrested Sunday at his Edgewater home, Cooper said. Cook County Judge Peggy Chiampas on Tuesday ordered Randall held without bail, noting that the victim and his family "were in the process of gathering their belongings — and the three children who were there — to evade this defendant." FOR A COMPREHENSIVE LOOK AT OUR YOUNG PAPPY COVERAGE, CLICK HERE.